Wed in an arranged marriage to a man nearly fifty years her senior, sixteen-year-old Eileen O’Connell goes from being one of five unmarried sisters to become the mistress of Ballyhar, the great estate of Buy Book Here! John O’Connor, one of the wealthiest and most influential men in Ireland. Headstrong and outspoken, Eileen frustrates her brother’s wishes, as, through the auspices of her uncle, General Moritz O’Connell of the Imperial Austrian Army, she, along with her ebullient elder sister, Abigail, spend the ensuing richly-dramatic and eventful years at the court of the Empress Maria Theresa in Vienna. The sisters learn to navigate the complex and frequently contradictory ways of the court—making a place for themselves in a world far different from remote Derrynane. Together with the general, they experience a complex life at the pinnacle of the Habsburg Empire. The tantalizingly few documented historical facts that are actually known of the lives of the O'Connell's and some of their fellow "Wild Geese" provide the basic threads around which the tale itself is woven, into which strategic additions of numerous fictional and historical personalities and events intertwine seamlessly. Kevin O'Connell is a native of New York City, the descendant of a young officer of the Irish Brigade of the French army. He holds both Irish and American citizenship. For much of his four decades-plus long legal career, O'Connell has practiced international business transactional law. 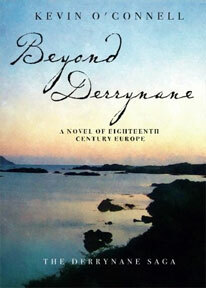 A lifelong personal and scholarly interest in the history of Eighteenth Century Ireland as well as that of his extended family led him to create his first book, Beyond Derrynane: A Novel of Eighteenth Century Europe, which will, together with the three books to follow, comprise The Derrynane Saga.